PHOTO BY MIKE HANLON A filet mignon and vegetables served at Grinnell's. 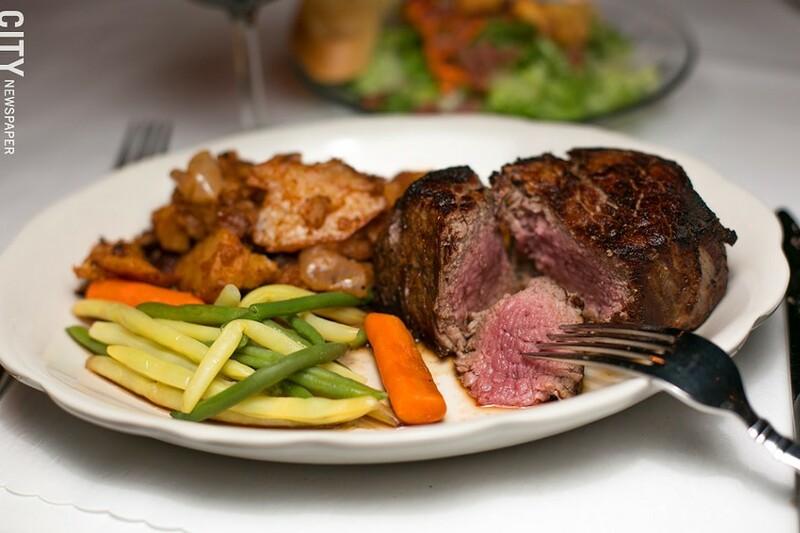 The Monroe Avenue chophouse is a Rochester staple, having existed for more than 50 years. 1696 Monroe Ave. | 244-3710, grinnellsrestaurant.com | Monday-Thursday 5-10 p.m., Friday-Saturday 5-11 p.m., Sunday 4:30-9 p.m. In the world of restaurants, a place is "old" when it manages to last a decade. At 20 years, people start calling it an "institution." At 30, the word "beloved" is often bandied about. Almost no restaurant survives to the half-century mark, and those few that do have more often than not long since abandoned their original concept, and their original owners for that matter. Normally, a 50-year-old restaurant would be unrecognizable to diners who ate there when the restaurant was new. Grinnell's on Monroe Avenue is the exception that proves that rule. At 51 years old, Grinnell's is still very much the restaurant that it was when brothers Al and Fred Grinnell opened it in 1961. Sure, the place is bigger than it originally was, and the interior has had a few updates (the most recent was about a year ago). There are even a couple of flat-screen TVs above the bar. But as Al's son David Grinnell (who has owned the place with his cousin Rick DeMetri since 1979) will tell you, "the meat and bones" of the original restaurant are still there. Here, lamb chops are still served with mint jelly, pork chops come with a side of apple sauce, and the vegetables are really just garnish on plates full of meat. Grinnell's is a chophouse of the old school, a throwback to the days just before those pesky French guys arrived in New York with their nouvelle cuisine — a place to indulge in strong drinks and steaks in an approximate two or three to one ratio. No dinner at Grinnell's starts without at least one cocktail. While I'm sure that you could order something complicated here, I'm not sure you would get it. Martinis, manhattans, maybe a couple of collinses, and glasses of wine are about the extent of what the bar offers, and the bartenders pour with a very generous hand. The gin and tonic I ordered to sip while I looked at the menu on my first visit was so strong that I wondered if the bartender had simply held the tonic tap next to the glass before sending the drink out rather than putting any in it. The same was true for other drinks I had on my second visit. If you manage to make it to your entrée without a bit of a buzz it's certainly not the fault of the bartender. Given how strong the drinks are, it's perhaps a good thing that you could order at Grinnell's without ever looking at the menu. Steaks and chops (pork and lamb) are the centerpiece of the menu with chicken and veal — served both French and marsala style — playing a supporting role. The appetizers are equally old school: shrimp cocktail, broiled shrimp scampi, artichokes French, beans and greens, and stuffed mushrooms, along with soup du jour, and a small selection of salads. On my first visit, I was initially unaware that my spinach salad — nice emerald leaves tossed with food-service croutons heaped attractively on the plate and drizzled with a warm bacon dressing ($3 as a side, plus $1.75 for warm bacon vinaigrette) — was going to be the high point of my meal. The salad was wonderfully fresh, and the dressing was just hot enough to wilt the leaves without leaving them soggy. I used a piece of the restaurant's signature garlic bread, which had no discernible garlic taste, to mop the plate. Casting a wide net, I ordered the mixed grill: a lamb chop (ordered medium rare), a pork chop (medium), and a grilled Italian sausage with Lyonnaise potatoes ($24.95). My companion requested veal French with a baked potato ($18.95). No one could ever fault Grinnell's for its portion sizes. My mixed grill overwhelmed my plate, pushing the tiny serving of green beans, wax beans, and carrots so far over to the edge of the plate that I didn't even see them at first. The lamb chop was fully 1.5" thick with a very pleasant looking char on the surface. It was, unfortunately, cooked well past medium with almost no pink (and no juice) left in it at all. Still, sliced thin with a dab of mint jelly it wasn't half bad. The pork chop, though, was almost inedible, even with a generous bit of applesauce to rehydrate each desiccated bite. The sausage, with its faint fennel and crushed red pepper zing, had a good flavor and the skin had been expertly cooked to the point of crispness without splitting open, thus retaining the juice inside the sausage rather than spilling it over the fire. My companion's veal French was equally disappointing, the veal paper thin but still somehow a bit tough, the egg-batter coating sliding off of each piece rather than cleaving to the meat as it should have. The sauce, however, was very pleasant, even fragrant, with lemon and butter tied together with white wine. On my second visit, thinking that Grinnell's could be the sort of place where a couple guys could go drink manhattans and toss back a big ol' steak, I opted to sit at the bar. I enjoyed my first gin and tonic with a plate of mushrooms stuffed with Italian sausage and breadcrumbs and then broiled ($6.95) — a nice savory, meaty counterpoint to a strong cocktail. My companion and I ordered strip steaks, one rare, the other medium rare, both with baked potatoes ($27.95). Calling either steak medium on delivery would be generous. Bloodless and tough, my steak was shot through with strings of gristle. I ate only 6 oz. or so of the 14 ounces of meat, turning my attention to the perfectly baked potato it was situated next to on the plate. It seems odd to call attention to the starch, but the art of baking potatoes has largely been lost in the microwave age. A properly baked potato acquires an almost papery thin, pleasantly earthy skin with the flesh underneath rendered sweet and fluffy — positively aching for butter and sour cream, which Grinnell's thoughtfully provided lots of. I probably shouldn't be eating so much meat anyway.